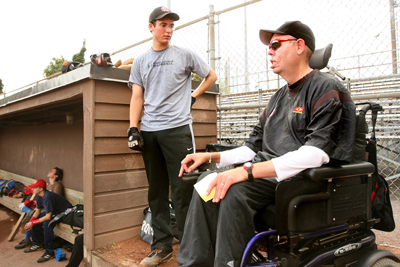 Carey Ashton, the bench coach with the McGill men’s baseball team, has won the 2010 Chunky Most Valuable Coach award. The Montreal native had been one of six finalists from nearly 900 nominated coaches from across Canada, and went on to receive the most votes in an internet balloting process to take the MVC title along with $25,000 to help fund sport for his athletes and community. Despite being diagnosed with muscular dystrophy at a young age, Ashton has coached and proven to his young athletes and the community at large that you can do anything that you set your mind towards. A huge contributor to the community, Ashton has been nominated for coach-of-the-year honours many times and in 2007 was named as the “Community Unsung Hero of the Year” by a local Montreal radio station. “One of the many reasons I enjoy coaching is that allows me to look beyond my disability,” said Ashton. “I hope it also inspires other people with disabilities to get involved in the community and follow their dreams, whatever they may be. From a prizing perspective, I’m very appreciative because the bulk of it will be used to help pay for our team expenses, many of which involve my transportation costs. This will also take a huge burden off the parents who do such a great job fundraising every year. I would also like to give a portion of the prize money to the McGill baseball team, to help lower the registration fees for the student athletes. A 13-year veteran baseball coach, Ashton also serves as head coach for the NDG Junior Lynx, consisting of players ages 13 and 14. Since his involvement in the Lynx program, Ashton’s major, junior and senior teams have won a combined five provincial titles and represented Quebec five times at the Canadian Little League championships. As a bench coach for the McGill Redbirds, he helped guide the team to the 2006 national championship in the Canadian Intercollegiate Baseball Association, McGill’s first such title. The Chunky MVC program is an official nutrition sponsor of the Coaching Association of Canada.